In large bowl, beat reserved 1/4 cup cake mix, the cream cheese, chocolate, sour cream, sugar and food color with electric mixer on medium speed until smooth. Beat in eggs, one at a time, just until blended. Pour over crust. Bake 1 hour 5 minutes to 1 hour 15 minutes or until edge of cheesecake is set at least 2 inches from edge of pan but center of cheesecake still jiggles slightly when moved. Turn off oven; open oven door 4 inches. Leave cheesecake in oven 30 minutes. Remove from oven and cool in pan on cooling rack 30 minutes. Refrigerate 6 hours or overnight. Run small metal spatula around edge of pan; remove side of pan. Pipe whipped topping around outer edge of cheesecake. Store covered in refrigerator. If you’d prefer, the whipped topping can be spread over the top of the cheesecake. The name of this recipe speaks for itself; velvet perfectly describes the luscious texture and this classic cake. Traditionally the layers of red velvet cake are surrounded by cream cheese frosting, but this recipe goes a step further by including cream cheese in the cake itself. 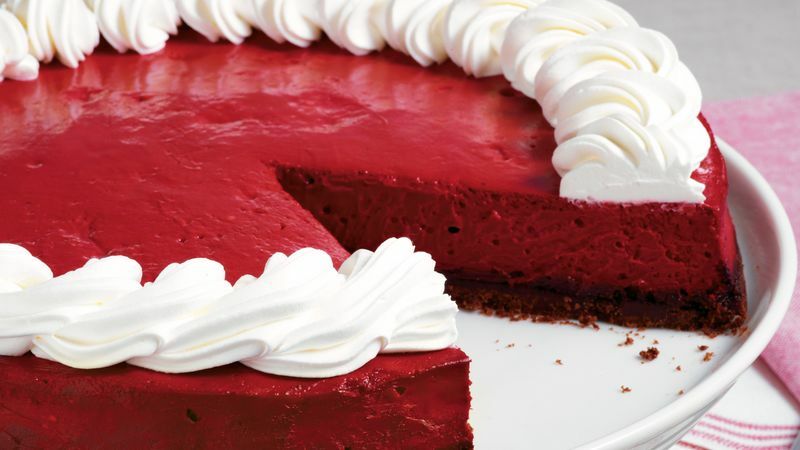 No matter which of Betty’s best red velvet recipes you’re making, the color is perfect for celebrations on Valentine’s Day or Christmas. And with just 20 minutes of prep, this recipe gives you plenty of time to organize the rest of your meal. Just make sure to explore Betty’s tips for cake making before you begin!